Recombinant fragment corresponding to Human EXOSC5/CML28 aa 1-185. HeLa cells; Human BT483 xenograft. Our Abpromise guarantee covers the use of ab154718 in the following tested applications. Non-catalytic component of the RNA exosome complex which has 3'->5' exoribonuclease activity and participates in a multitude of cellular RNA processing and degradation events. In the nucleus, the RNA exosome complex is involved in proper maturation of stable RNA species such as rRNA, snRNA and snoRNA, in the elimination of RNA processing by-products and non-coding 'pervasive' transcripts, such as anti-sense RNA species and promoter-upstream transcripts (PROMPTs), and of mRNAs with processing defects, thereby limiting or excluding their export to the cytoplasm. The RNA exosome may be involved in Ig class switch recombination (CSR) and/or Ig variable region somatic hypermutation (SHM) by targeting AICDA deamination activity to transcribed dsDNA substrates. In the cytoplasm, the RNA exosome complex is involved in general mRNA turnover and specifically degrades inherently unstable mRNAs containing AU-rich elements (AREs) within their 3' untranslated regions, and in RNA surveillance pathways, preventing translation of aberrant mRNAs. It seems to be involved in degradation of histone mRNA. The catalytic inactive RNA exosome core complex of 9 subunits (Exo-9) is proposed to play a pivotal role in the binding and presentation of RNA for ribonucleolysis, and to serve as a scaffold for the association with catalytic subunits and accessory proteins or complexes. Highly expressed in a variety of hematopoietic and epithelial tumor cell lines, but not in normal hematopoietic tissues or other normal tissue, with the exception of testis. Belongs to the RNase PH family. Nucleus > nucleolus. Cytoplasm. Nucleus. 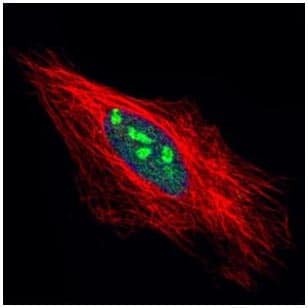 Immunofluorescent analysis of paraformaldehyde-fixed HeLa cells labeling EXOSC5/CML28 with ab154718 at 1/500 dilution (Green). Alpha-tubulin filaments were labeled red. Immunohistochemical analysis of paraffin-embedded BT483 xenograft labeling EXOSC5/CML28 with ab154718 at 1/500 dilution. ab154718 has not yet been referenced specifically in any publications. Publishing research using ab154718? Please let us know so that we can cite the reference in this datasheet. There are currently no Customer reviews or Questions for ab154718.